Downer has partnered with the City of Adelaide to construct a road made completely from recycled material. The recycled road is made up of reclaimed asphalt pavement from local streets and recycled vegetable oil from local suppliers. The recycled asphalt mix has been processed through Downer’s state-of-the-art asphalt plant in Wingfield, before being laid on Chatham Street in the city’s southwest. According to Stuart Billing, Downer’s general manager – pavements, this milestone demonstrates the importance of partnerships with other thought leaders to set new benchmarks in recycling and repurposing local materials into new streams of use. “Together with City of Adelaide, we have set a new benchmark in achieving sustainable solutions through thought leadership and a determination to make a positive difference,” Billing said. “Further to the direct sustainability benefits of using renewable materials, the 100 per cent recycled road saves up to 65 per cent CO2e emissions when mixed at a lower temperature (warm mix asphalt), compared to standard asphalt made with virgin materials. 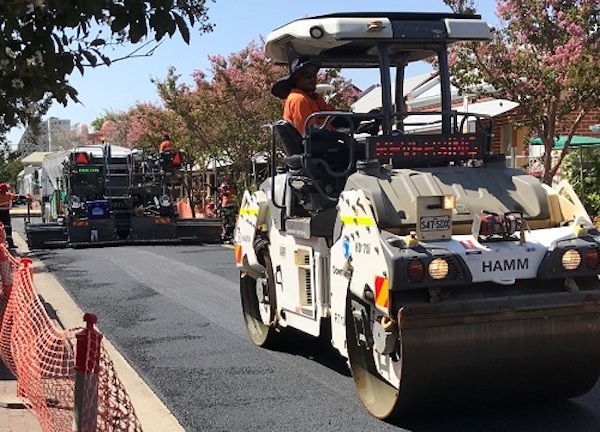 “Just as importantly, our Australian-first 100 per cent recycled asphalt is about 25 per cent stronger than standard asphalt, which means it will be able to better resist deformation. Lord mayor Sandy Verschoor said that this achievement aligns with Council’s ambitions to become a leading smart, green, liveable and creative city. “The project originates from a Motion on Notice brought to Council last year, which asked the administration to seek to maximise the amount of recycled material used within our roads,” Verschoor said. “This is a great example of Council using innovative methods to improve the work we do throughout the city. At around the same cost as the standard process, the recycled road is cost-effective and, as we’re recycling our own materials, it has a great benefit to the environment.